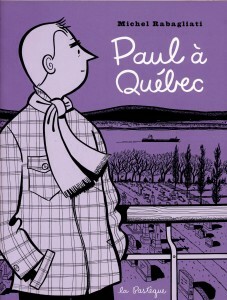 We’ve waited three long years for the English translation of Michel Rabagliati’s internationally acclaimed Paul à Québec, his sixth album in this semi-autobiographical series. As in Rabagliati’s previous stories, the author addresses a milestone in Paul’s life. Our protagonist is your average middle-class nice guy, a husband to Lucie, and a father to Rose. In short, Paul is someone readers can readily identify with. Paul, now almost 40, moves with his family from their urban apartment to a modest home, just as he is hitting his stride in his career as a graphic artist. In other words, life is good. But on a long holiday weekend with Lucie’s parents and extended family, Paul inadvertently discovers that his father-in-law Roland is sick. While The Song of Roland is about Roland’s life and legacy, this intergenerational portrait is also about family, love, and coping. Of course, the story will bring many readers to tears, but Rabagliati expertly negotiates the theme of death by adding moving family memories and generous doses of humour to keep things light and the narrative moving. The old-school federalist and quintessential self-made man, Roland is also a likeable character. Born into poverty, he came of age in the prosperous post-war era and achieved relative wealth through hard work and determination, back in the day when success did not require a higher degree. His political views differ from those of his offspring, who came of age at the height of Quebec nationalism. But for all his hard work in life, Roland’s new rank among the dying is unbearable for the former executive, and true to the Kübler-Ross model, Roland proves to be a stubborn, difficult patient for hospice staff at the beginning of his three-month stay. Rabagliati’s treatment of time in The Song of Roland is nothing short of masterful. As anyone who has lost someone can attest, the final months and days are excruciatingly long, and time indeed moves very slowly. To illustrate this, the author decelerated time segments by increasing his number of frames. In his beautiful broad ink brushstrokes, Rabagliati shows us Paul’s final drive to bid farewell to his father-in-law in no less than 22 frames, adding highly realistic yet extremely banal detail, such as Paul fastening his seatbelt, turning right onto Sauvé East, taking the Louis-H.-Lafontaine tunnel, and even passing by IKEA. The author successfully draws out the sequence while maintaining the reader’s interest. In terms of graphic elements, the most stunning is Lucie’s nightmare, foreshadowing her father’s death. Rabagliati contrasts a sequence of luminous open spaces in which an adolescent Lucie and her father are clowning around on a summer’s day with that of Lucie walking alone in a dark dense forest with short teeth-like branches. Amid the darkness, Lucie comes across a small structure awash in light with a tiny Virgin Mary statue on the forest floor and then comes face to face with the shadowy grim reaper wielding a shot gun. Another poignant visual is the floral pattern created by Roland’s final injection of morphine. The Song of Roland has been hailed as Rabagliati’s mid-career masterpiece and with good reason. This is his best yet. But the dramatic change in title for the English version will certainly raise some eyebrows. Why the sudden shift in emphasis from Paul to Roland? Could it be the new publisher? Anyway, diehard Paul fans who have patiently waited for the translation will not be disappointed. Once again Rabagliati, the storyteller, gives us another highly realistic and riveting chapter in Paul`s life, while Rabagliati, the artist and craftsman, skilfully brings his readers close enough to the action to make them feel personally involved in the story. This review was first published in the summer 2012 edition of the Montreal Review of Books. 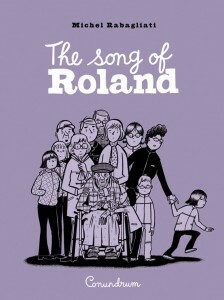 : Review of The Song of Roland by Michel RabagliatiTweet this!